PHOTO: Allen Ramsey, DWCPhoto.com. Highlands senior Trent Buchert (4) finds the end zone in the first half against Boone County. The Bluebirds held off the Rebels, 48-28 to end the regular season. The start is something any football team loves to see. The Highlands Bluebirds (3-7 overall) jumped out to a 21-0 lead capitalizing on two lost fumbles from the visiting Boone County Rebels (1-9). Highlands did not put away the visitors like what happened in the 50-0 win at Grant County in a game that took just an hour and a half. But the Bluebirds did finish the regular season with a 48-28 victory to grab a two-game winning streak going into the playoffs. "That's that we try to do every week. We try to come out and get a fast start," said Brian Weinrich, Highlands Head Coach. "We were able to get some turnovers. The defense was playing great. We were up (14) points before they ran an offensive play. That definitely helps, but we have a situation where we can't let them back in the game and we did (Friday). We let it be a game when it shouldn't be a game there at the end." Boone County lost two fumbles and threw an interception and Highlands had just one turnover on an interception. Highlands senior linebacker Dalton Cornett recorded his team-high seventh fumble recovery on the season and sophomore defensive lineman Trent Johnson had his first fumble recovery of the year. Senior defensive back Bradley Greene recorded his first interception of the season in the second half. "You have to take advantage of the opportunities," said Shelby Jones, Highlands Defensive Coordinator. "We preach that every day. It's that important because you saw how getting up early helps a lot. We've been on the other end of that." Highlands entered the game with 15 fumble recoveries this year, but only had two interceptions. 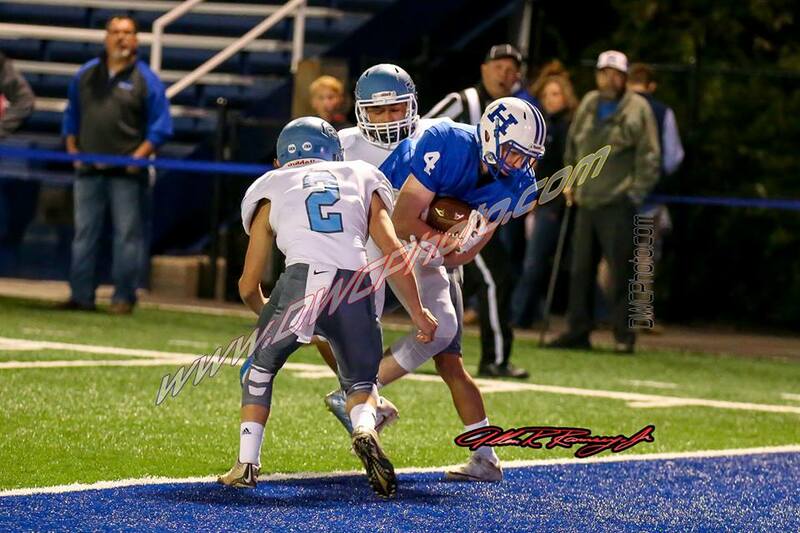 Green's interception marked the first one for the Bluebirds since senior defensive back Sam Taylor picked off a pass in the loss to Simon Kenton. Senior defensive back Kyle Rust had the other interception against Campbell County. "It's pretty cool to get turnovers," Greene said. "We haven't been producing enough of them so once we get them, they feel pretty good. Interceptions have been kind of rare this season." Boone County ended up out-gaining Highlands, 498-477 in total offense. But the Rebels had to run 88 plays to just 52 for the Bluebirds. The Bluebirds averaged about 9.2 yards per play to 5.4 for the Rebels. Highlands had three touchdowns of 20 or more yards compared to one for Boone County. Highlands ran the ball well this game going for 258 yards on 29 carries for an average of about nine yards per touch and passed for 219. 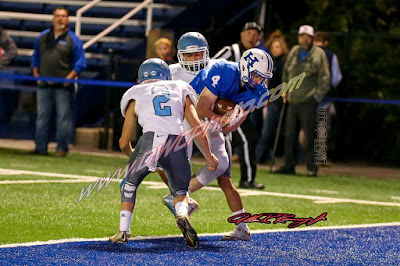 Bluebird senior quarterback Brady Gosney directed the offense as well as he has all season rushing for 92 yards on seven carries and two touchdowns for an average of more than 13 yards per carry and completed 10-of-17 passes for 219 yards, three touchdowns and an interception. The offensive line knew it had to execute against Boone County's 4-3 defense. "Everything (such as) hands, feet, all the small stuff you don't see got better," said Sam Sparks, Highlands junior center. "The (Rebel defenders) did what they're supposed to do. We just had to beat them to the ball." Highlands saw senior running back Grant Murray have a big game rushing the ball going for 175 yards on 19 carries and two touchdowns for an average of 9.2 per carry. Junior Nick Veneman led the Bluebirds with five catches for 163 yards and a touchdown. "When we're running and passing, we're pretty hard to stop," Murray said. "We stop ourselves sometimes. If we clean up those mistakes, we're pretty good." Boone County rushed for 256 yards on 54 carries for an average of 4.7 per carry. Senior Brandon Morgan led the Rebels going for 92 yards on 16 carries for an average of 5.75 yards per carry. Boone County threw in some balance. Senior quarterback Alex Schwartz completed 17-of-30 passes for 242 yards, two touchdowns and an interception. Senior Rondell Douglas led the Rebels with nine catches for 141 yards and a touchdown. Boone County did a little better on fourth down, but the Bluebird defense stopped a couple Rebel drives on fourth down. The Bluebirds converted 2-of-7 on third down for 29 percent and 2-of-3 on fourth down for 67 percent. The Rebels converted 7-of-15 on third down for 47 percent and 2-of-5 on fourth down for 40 percent. Highlands senior linebacker Trey Bowden sacked Schwartz to set up a 2nd-and-long on one series. "Playing (defensive) line, a lot of times (the fans) don't see what you do anyway," said Bruce Seidel, Highlands senior defensive lineman. "The hard work shows off for you, the coaches and the team. It contributes to the team and makes you feel good." The Bluebirds received the opening kickoff and moved right downfield. Gosney hit Veneman for a long pass before finishing the drive when Gosney hit senior Trent Buchert for a 10-yard touchdown strike. After Cornett recovered a Rebel fumble on the kickoff return, Murray pounded his way up the middle for a 3-yard score to put Highlands up 14-0 less than two minutes into the game. Highlands then went up 21-0 with 5:06 left in the first quarter. Gosney rolled right and scored from three yards out capitalizing on Johnson's fumble recovery. The Bluebirds dug into the playbook after the Rebels stopped a run up the middle that had been successful on previous drives. "They big, strong up front. Their linebackers are really active," Weinrich said. "When they read (the play), they go. They don't play out of position. That's why you have to execute against them. It's hard to get things consistently on them so you have to keep hitting different spots to keep them them off-balance because if you try to do the same things over and over, they tee off on you." Boone County hit the scoreboard late in the first quarter. Schwartz hit Morgan for a 20-yard touchdown, but the Rebels missed the extra-point attempt leaving the score 21-6 Bluebirds after one quarter. Highlands extended the lead to 35-6 in the second quarter. Gosney broke free for a 38-yard touchdown before he hit Murray on a go route down the left sideline for a 27-yard touchdown. The Bluebirds held the Rebels on 4th-and-goal in the half's final minutes. But Morgan had a 15-yard interception return for a score leaving it 35-14 Bluebirds at halftime. The teams exchanged touchdowns in each of the third and fourth quarters. Murray broke free for a 63-yard touchdown in the third quarter before Morgan scored from two yards out. Highlands led 41-20 after three quarters. The fourth quarter saw Gosney hit Veneman for a 19-yard touchdown. But the Rebels responded later in the game when Schwartz hit Douglas for a 35-yard touchdown. Highlands finished as the third seed in Class 5A, District 5. The Bluebirds travel to face the second seed out of District 4 in the Louisville Doss Dragons (5-5) on Friday. Game time is 7:30 p.m.